Posted Mar 20, 2019 by Eds. The second interview in the series, published below, is with the Venezuelan sociologist Reinaldo Iturriza, who was a Professor at the Universidad Bolivariana de Venezuela and who previously served as Minister of the Communes and Social Movements (2013-14) and Minister of Culture (2014-16). Iturriza is a well-known Venezuelan writer and a respected analyst of the Bolivarian revolution. In this interview, he calls on the international left to reject the “neither-nor” position, which rejects the legitimacy of both Guaidó and Maduro, and instead urges those who want to express solidarity with the Venezuelan people to place themselves firmly on the side of popular struggles and voice their critique of the Maduro government within the revolution, rather than outside or against it. As the perceptive reader will notice, Iturriza’s position differs in several important respects from the reading offered by fellow Venezuelan sociologist and left-wing intellectual Edgardo Lander in a previous interview, published here. We offer these different perspectives on the assumption that the critical and intelligent reader will be able to make up their own mind as to which reading they find most persuasive, and which position they are most comfortable to align themselves with. 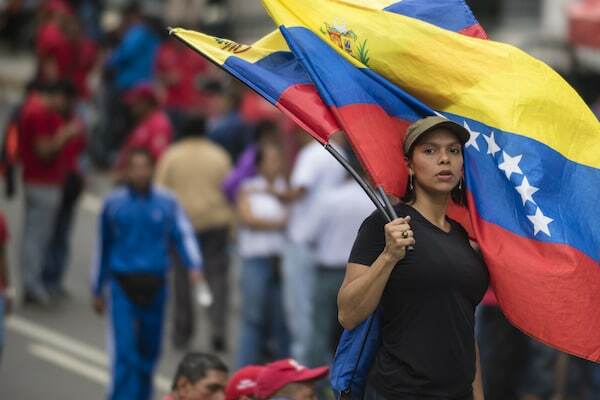 We are currently preparing two more interviews with Venezuelan activists that we hope to publish over the next weeks. We consider these grassroots perspectives particularly important in the present context, given the international media’s systematic inattention to (and active marginalization of) the voices of ordinary Venezuelans. In the process, we hope to relay some of the complexity of the present situation on the ground, while at the same time continuing to insist on the importance of the key principles of anti-militarism, non-intervention, self-determination, radical democracy, and solidarity with the marginalized and oppressed. It’s been six weeks since the virtually unknown opposition leader Juan Guaidó proclaimed himself interim president in an attempted US-backed “soft coup.” Where do we stand now? Could you briefly walk us through the main political developments inside Venezuela over the past weeks? Even here in Venezuela there is little talk of this fact, but this latest attack builds on something that took place at dawn on Monday, January 21: the uprising of a small group of members of the Bolivarian National Guard, who called on the Venezuelan people to stop recognizing Maduro as president and on other military units to rebel. This group was quickly neutralized, without any violence, without victims to mourn, but this gave rise to a series of very violent protests that peaked precisely on January 23, the date of Guaidó’s self-proclamation. This fact illustrates one of the main objectives of the first phase of the conspiracy: to break down the Bolivarian National Armed Forces (FANB) and to encourage the mobilization of the people against the Bolivarian revolution — in other words, to break the Venezuelan people. None of this has occurred. As important as the event described above, is the decision to embargo goods of the state-owned Venezuelan oil and natural gas company PDVSA in United States territory, continuing a systematic policy of aggression against the Venezuelan economy and specifically against its petroleum industry. More recently, there was the attempt to let “humanitarian aid” enter the country, clearly a pretext to prepare the ground for a military intervention, with strong support from the Colombian government. There is something else worth highlighting: following the self-proclamation on January 23, street violence has basically come to a halt. A tense calm reigns in the country. After February 23 — after the attempt at military aggression failed — the situation is significantly less tense, with the vast majority of the country grappling with the very difficult economic situation, trying to move forward. How likely do you consider the threat of a civil war or U.S. military intervention to be at this point? Has this threat subsided or increased due to the “failure” of Guaidó’s bid to oust Maduro in the short run? The threat has not entirely disappeared. We are convinced that a military operation against Venezuela is underway, which up until now has been focused on psychological aggression (including death threats against military leaders and President Maduro himself), attacking the economy, and sabotaging public services. But this operation has not entered its military phase. Despite the attempts, the psychological aggression has not managed to break the FANB. We were already very close to a civil war in 2014, and especially in 2017. Until now, we have managed to overcome those threats. But the possibility of U.S. military aggression is still latent, especially as its efforts to produce an implosion fail again and again. You previously served as Minister of Popular Power for the Communes and Social Movements. The role of popular power and grassroots organizing in Chavismo has received hardly any attention outside of Venezuela, with the international media focusing overwhelmingly on opposition protests. Could you tell us a little bit about the history of popular self-organization and direct democracy in Chavismo, especially in the movement of communal councils and worker-run cooperatives? That ominous silence with respect to Chavismo’s social bases is, fundamentally, what induces superficiality or error into an enormous number of analyses about what is happening in Venezuela. The social bases were the political subject that made Chávez possible and that later strongly defended him [in the face of a US-backed military coup, ed.]. The popular fabric that it eventually managed to construct is what has made the continued existence of this government possible. The same thing holds with regards to the FANB: there is an abundance of superficial analyses about the reasons that would explain its support for democracy. These analyses never try to understand, for example, the class origin of the members of the military. The international media displays a potent mix of ignorance and prejudice regarding Chavismo — but there is also a deliberate intent to obscure popular support for the government, and beyond that, to obscure the thoughts and feelings of the popular classes, for the simple reason that the media are alienated from Bolivarian democracy. Obviously many people inside the popular classes now find themselves in a very difficult position — faced on the one hand with a government that has failed to adequately respond to the crippling social and economic crisis, and on the other with a US-backed right-wing opposition that is intent on destroying all expressions of popular power. How are grassroots Chavistas responding to this complex situation? What is their position with respect to the Maduro government? Something that is often ignored is that the social base of Chavismo has always, from the first day, been severely critical in its evaluation of the government. It was also like that with Chávez. His strength as a leader had to do precisely with his extraordinary capacity to be open to criticism from below, to popular questioning. Criticism of the government is therefore nothing new. Rather than a problem, this is actually a sign of the vitality of the Bolivarian revolution. The Chavistas are capable of considering that their government is doing something poorly, or that its efforts are insufficient, but they realize that it nevertheless continues to be the government of the people. Clearly, the alternative can never be a regime imposed by the United States. Recognizing this, it is easy to see why there is no dilemma in the choice between Maduro and Guaidó: the right-wing opposition supported by the United States is simply not an option. Speaking of this supposed dilemma: certain voices inside Venezuela are now calling for the left to take a “neither-nor” position, rejecting both Guaidó and Maduro. What do you make of this? It is an imposture that can only be maintained by ignoring what the Chavistas think and feel, or by marking one’s distance from popular struggles, misunderstanding them — even if this position is supposedly taken up in the name of those same struggles, of Chavismo itself, or by claiming to mount a critique from the left. The distance from the actual struggles of the popular classes is exactly what makes this position so deceptive. In Venezuela, there is a long-standing conflict between two historical projects, even if there are strong tensions within each of the opposing forces, and even if there is an intense dispute within Chavismo itself about the strategic orientation of the Bolivarian revolution. At the personal level, even if a good part of the Venezuelan people decide to stop struggling, my principled stance is to always align myself with the people who struggle and never to assume postures that can be functional to the Venezuelan oligarchy or to United States imperialism. What do you propose as a way out of the current crisis? What can or should the international left do to support the Venezuelan people at this difficult time? There is a lot that the international left can do. In fact, its actions can be truly decisive. I’ll give just one example: Roger Waters. Venezuela does not need uncritical or condescending support. We do not want that. Let there be critique, even public critique, but within the revolution, placing itself on the side of popular struggles, of the people who cannot continue to be rendered invisible. Critique must give a voice to the people and create the conditions so that these voices are multiplied. It must continue to inform. There is a lot that the international left can do to help us break through the media’s brutal informational and analytical blockade about what is really happening in Venezuela. It must carry out rigorous analyses about the causes of the current crisis and investigate the history: where does Chavismo come from, how does it emerge, how has it managed to resist such a huge onslaught of imperialism? In the end, we are part of the same struggle. Reinaldo Antonio Iturriza López is a Venezuelan sociologist, militant, writer and currently a researcher at the Center of National History. He was Minister of the Communes and Social Movements (2013-14) and Minister of Culture (2014-16). He is the author of 27 de febrero de 1989: interpretaciones y estrategias (2006) and El chavismo salvaje (2017).